Vivec's Antlers is a historical battlefield found in the region of Stonefalls, within the province of Morrowind. 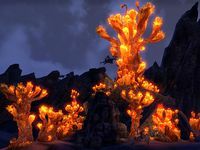 Not only has the fields of Vivec's Antlers been the site of several battles in Morrowind's history, but it contains the best-known example of a bizarre form of Land Coral along the Inner Sea. The local Dark Elves claim that the Land-Coral is both self-aware and thoughtful. Vivec's Antlers is the home of Coral Heart. During the Second Akaviri Invasion of 2E 572, the fields of Vivec's Antlers served as the setting for the final battle involving the Snow Demons of Kamal and their invasion of the province of Tamriel. The battle had begun between the Akaviri, led by Ada'Soom Dir-Kamal, and the Dark Elves, under the command of Almalexia and her leading general, Grandmaster Tanval Indoril. Despite the assistance of Vivec, whose drowning of the Akaviri in Vivec's Antlers is referenced in the Dunmeri culture, the Akaviri had the upper hand and had forced the Dark Elves east into prepared defenses. As the Nords under Jorunn the Skald-King and Wulfharth landed and fell upon the Akaviri rear, the tide of battle turned but the Kamali lines remained intact as they retreated to the Inner Sea, where they desperately tried to hold out for evacuation. It wasn't until the surprise arrival of the Argonians under the command of Heita-Meen, that the Akaviri were ultimately defeated. The combined forces of these races would go on to to establish the Ebonheart Pact. Vivec's Antlers would be the site of another battle ten years later in 2E 852, between the Ebonheart Pact and the Daggerfall Covenant, and even the local dreugh of Vivec's Antlers. The Covenant general Alexandra Conele had staged her camp on the shores of Vivec's Antlers, seeking to pillage the site and find the Coral Heart in the chance to summon Sadal, one of the Brothers of Strife, to lay waste against the region of Stonefalls. However, Conele's operation was halted and the Coral Heart was acquired by the Ebonheart Pact. The Coral Heart would later be used in Sadal's summoning by Tanval Indoril, after the fateful battle at Fort Virak. This page was last modified on 31 December 2018, at 08:08.